The primary goal of this residency is to provide basic art education while teaching students about other disciplines. Linda Lacy's special DBAE teaching methods include: pencil sketching (studies of perspective), painting (with various media), color/composition, art history and appreciation, and calligraphy/creative writing, to students K-8 in elementary schools. Specific media of watercolor, oil painting, and sculpture are available to senior high school students and community group organizations. 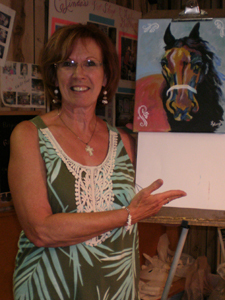 Linda hopes to instill an appreciation of art in young people, and give them the confidence to pursue their dreams. A complete portfolio of lesson plans and a wide variety of media and activities are available upon request. Recent activities in this portfolio include painting murals with children using an 'Art in a Democracy' theme and a study of heritage incorporating antique photos and calligraphy entitled 'Who We are and Where We Came From.' The artist shares her special experience of camping and hiking in National Parks and deserts of the southwestern United States with her complete documentation of watercolors just like explorers Lewis and Clark and artist, Karl Bodmer. Activities associated with this lesson are watercolor pencil paintings of Nebraska wildflowers.